8What shape is it in? 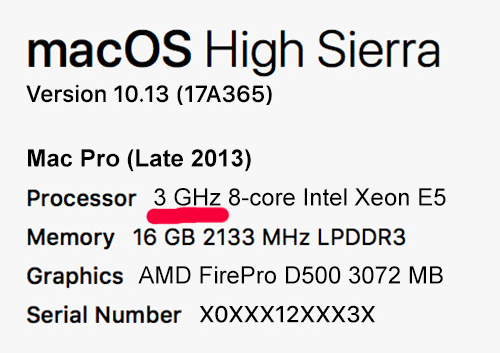 Your Mac Pro does not power on. Has severe physical damage accrued from regular office/home use. 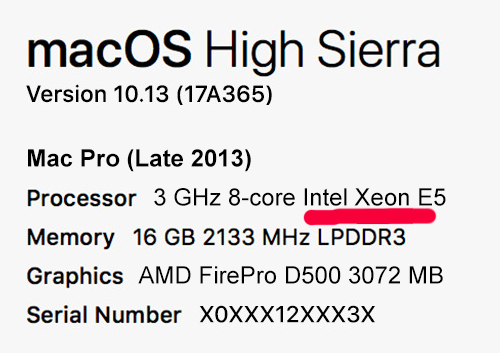 Has functional defects (i.e., ports are non-functional, system fan does not function, its logic board is dead and so on). Has signs of everyday use, but is 100% functional. May have light scratches, nicks and/or dents. Your Mac Pro has never been used or looks like a new Mac Pro. Absolutely no scratches, flaws, dents, nicks or scuffs on body or stand. By all means new, same as if you purchase from the store. Choose About This Mac from the Apple ( ) menu. You'll find the model year in the following window. Choose About This Mac from the Apple ( ) menu. You'll see the speed of your CPU under the Processor section. Choose About This Mac from the Apple ( ) menu. You'll see the type of your CPU under the Processor section. Choose About This Mac from the Apple ( ) menu. You'll see the number of cores of your CPU under the Processor section. Choose About This Mac from the Apple ( ) menu and click on the Storage tab. 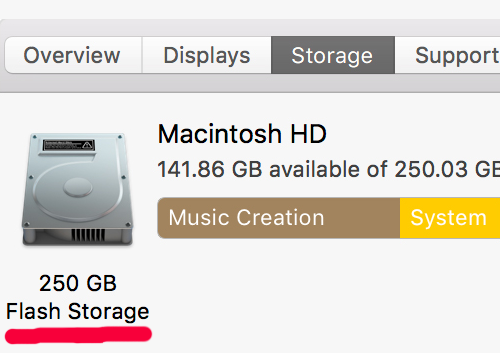 You'll find the size and the type of your storage in the following window. Choose About This Mac from the Apple ( ) menu. You'll see the size and the type of your RAM under the Memory section. Enter your Mac Pro specifications and get a free immediate quote in just seconds. Use the provided prepaid shipping label, just pack up your Mac Pro and ship to us. We’ll process your order after your Mac Pro arrives, & you’ll get your payment fast. 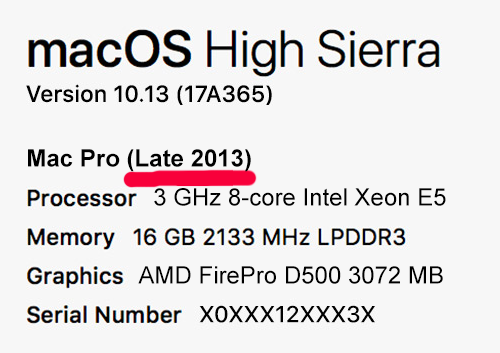 The second-generation design of Mac Pro was announced by Apple Inc. in June 2013. 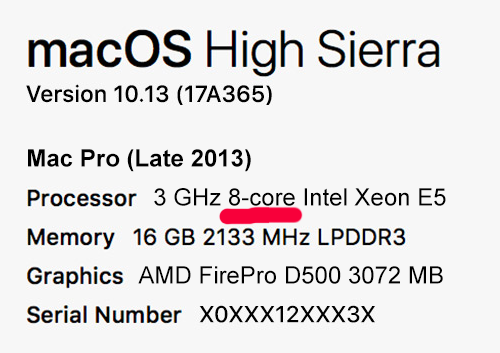 The current Mac Pro achieves twice the overall performance of the previous model, as it’s shorter, thinner and less massive. 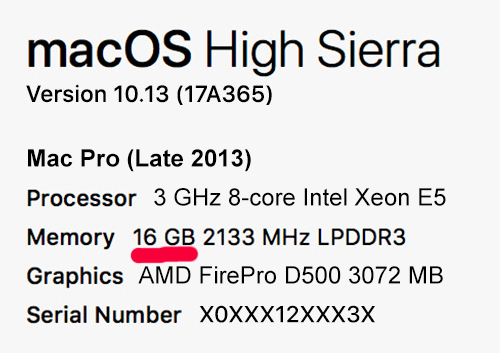 The redesigned Mac Pro takes up less than one eighth the volume of previous Mac Pro. Anyway, if you prefer to switch to another, newest Mac Pro model, you can always sell your MacPro computer online to iGotOffer for the best price. Still unsure? iGotOffer.com is an online service which allows people to exchange their used iPod, iPhone, iPad, iMac and other electronics for cash, even if they are broken or cracked. Thus, we buy your used and old devices and pay the best price online on the market for them. iGotOffer is a registered business to buy used electronics, and we have earned a 5-star customer rating and an A grade from Better Business Bureau customer service (BBB is a leading platform in advancing marketplace trust). We are also rated 9.8/10 on ResellerRatings.com website, a leading merchant reviews platform in the U.S. If you want to learn more about our company, you can read our Testimonials Page, or you can visit our Facebook Page, and our Twitter. You can also drop by our Apple Encyclopedia or our Microsoft Encyclopedia where you will find many useful texts. To follow the links to all the sites mentioned above, click here: What's iGotOffer. Your only concern is to make sure your Mac Pro is properly and safely packaged, to make sure the package safely arrives to us. Please carefully read our packaging and shipment guidelines before you send us your old Mac Pro: Shipment Guidelines.